Gregor Townsend has added 10 new faces to his squad for Saturday. Gray had been sidelined with a calf injury but is back to full fitness. 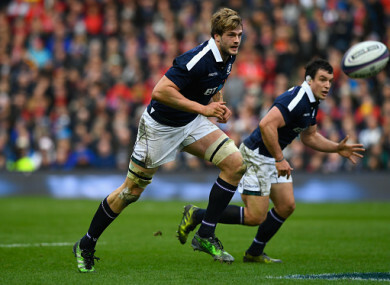 SCOTLAND HAVE WELCOMED back Richie Gray to their Six Nations squad as they look to build on victory over England by derailing Ireland’s title bid. Gray did not feature in Scotland’s opening three matches of the tournament due to a calf injury, but he successfully came through 80 minutes for Toulouse on Saturday in the Top 14. That was clearly enough to convince Gregor Townsend he was ready for an international recall, the lock one of 10 new faces for their trip to Dublin on Saturday [KO 2.15pm, TV3]. As well as the returning Gray, Scotland also welcome back Fraser Brown, Zander Fagerson and Alex Dunbar, while there is a first senior call-up for George Horne. Edinburgh back-row John Hardie is part of Townsend’s initial 40-man squad as Scotland look to cause another upset at the Aviva Stadium this weekend. Forwards: John Barclay, Simon Berghan, Jamie Bhatti, Magnus Bradbury, Fraser Brown, David Denton, Cornell du Preez, Zander Fagerson, Grant Gilchrist, Jonny Gray, Richie Gray, Luke Hamilton, John Hardie, Scott Lawson, Darryl Marfo, Stuart McInally, Willem Nel, Gordon Reid, Tim Swinson, Ben Toolis, Hamish Watson, Ryan Wilson. Backs: Mark Bennett, Alex Dunbar, Nick Grigg, Chris Harris, Stuart Hogg, George Horne, Pete Horne, Ruaridh Jackson, Huw Jones, Lee Jones, Blair Kinghorn, Greig Laidlaw, Sean Maitland, Byron McGuigan, Ali Price, Henry Pyrgos, Finn Russell, Tommy Seymour. Email “Fit-again Gray returns to bolster Scotland for Aviva Stadium showdown ”. Feedback on “Fit-again Gray returns to bolster Scotland for Aviva Stadium showdown ”.